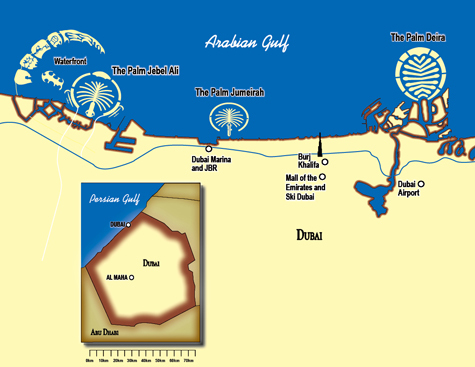 Dubai is the most populous member of the United Arab Emirates in the southeast of the Arabian Peninsula. In 1962, the UAE began exporting oil, which transformed the economy and society. Oil revenues were steered into healthcare, education and national infrastructure. UAE has the world's seventh-largest oil reserves and seventeenth largest natural gas reserves. Today, Dubai has emerged as a global city and a business and cultural hub of the Middle East and the Persian Gulf region. While Dubai's economy was historically built on the oil industry, the emirate's Western-style model of business drives its economy with the main revenues now coming from tourism, real estate, and financial services. Dubai has recently attracted world attention through many large, innovative construction projects. The city has become famous for its skyscrapers and boasts the world's tallest building, Burj Khalifa. Other ambitious development projects include man-made islands, extravagant hotels, and some of the largest shopping malls in the world. As of 2012, Dubai is the 22nd most expensive city in the world, and the most expensive city in the Middle East. Dubai has also been rated as one of the best places to live in the Middle East.